WINNING OVER CRITICS AND INFLUENCING PEOPLE. Shale gas has been hailed as a game changer worldwide, but many of the numbers being crunched are outdated – and the reality is a little more sobering. It’s worth picking up on US shale gas hype and bringing it down to earth in the Karoo. I met Faulkner, the soft-spoken CEO of Breitling Energy, when he presented on shale gas at a conference in Johannesburg. He was smartly dressed, self-assured and articulate. What I read in his interview with RIGZONE caused my jaw to drop open. RIGZONE’S Gene Lockard quizzed Faulkner on the recent decision by the New York Court of Appeals, in which the Court upheld lower court rulings, which allow municipalities to apply zoning ordinances to ban the practice of fracking within their borders. Now, as funny as this may (or may not) be, Faulkner’s gaffe earns him the top spot on the podium next to America’s greatest exaggerators. On a more serious note, it is exactly this type of talk that causes our leaders to be misinformed and make bad decisions on a monumental scale. Aubrey McClendon, ex CEO of Chesapeake Energy, on CBS News’ 60 Minutes November 14 2010: “In the last few years we have discovered the equivalent of two Saudi Arabias of oil in the form of natural gas in the United States. Not one, but two.” Asked by talk show host Stahl: “We have twice as much natural gas in this country, is that what you are saying, than they have oil in Saudi Arabia?” McClendon responded, “I am trying very clearly to say exactly that.” To place McClendon’s Saudi Arabia claim in perspective, in 2011, the annual BP Statistical review of Saudi Arabia was 264.5 billion barrels of proven oil reserves as at the end of 2010 – when McClendon made his claim. This is the equivalent of 1587 tcf. of natural gas multiplied by two (as in two Saudi Arabias) and thus equals 3,174 tcf or enough to power the US at its current rate of consumption for approximately 125 years. Also weighing in is the US Energy Information Administration (EIA). This body, largely responsible to US Congress for Energy forecasts, reduced Marcellus shale figures in Pennsylvania, in August 2011 from 410tcf to 84tcf after estimating reserves at 2tcf in 2002. During this time Professors Timothy Considine and Robert Watson of Penn State University, in what became known as the Penn State Report 2009 stated that “While reserve estimates… are somewhat uncertain at this early stage, estimates of recoverable reserves of at least 489 trillion cubic feet seem increasingly reasonable”. Reviewing the Zuma administration’s Shell-fed shale gas hype, I have to agree. Academic support for the shale gas boom was not far behind, although with a 50% caution, in the words of Professor Terry Engelder (Penn State University) who reported in the Fort Worth Basin Oil and Gas Journal (August 2009), that based on his own calculation, [there was] a 50% probability that the Marcellus would ultimately yield 489tcf. 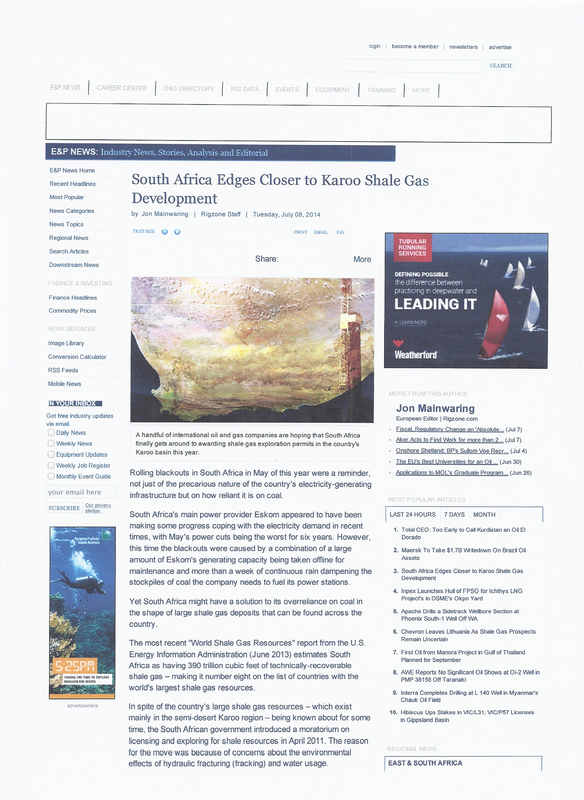 An online article July 8, by oil and gas industry mouthpiece RIGZONE proclaims “SOUTH AFRICA EDGES CLOSER TO KAROO SHALE GAS DEVELOPMENT” Peppered with inaccuracies, and drawing on phrases like ‘rolling blackouts in South Africa in May of this year’, the article regurgitates the industry speculation that we have heard in this country since January 2011. Here is the article. My reply to RIGZONE on their own online comment section may not be published, and is set out underneath the RIGZONE article. I believe that the article is poorly researched, and as one would expect biased towards the oil and gas industry that supports your publication. As proof, I mention just one point that jumps out of the text. ‘300 000 to 700 000 jobs over 25 years. (485tcf)’ Anyone who has done their homework knows that South African scientists long ago reduced that figure from 485 to 40tcf – so any estimates based on 485 are irrelevant – much like the industry hype and speculation over Monterey. No Sir, those backing shale mining in SA may feel that it is edging closer, but actually the news on shale gas globally is not good and is building a strong body of evidence against SA moving ahead under the current circumstances. Jonathan Deal, CEO, Treasure Karoo Action Group, South Africa. This sort of hype triggered “a speculation boom among oil companies” according to the LA Times. The EIA’s original survey for the US Department of Energy published in 2011 had been contracted out to Intek Inc. That report found that the Monterey shale constituted “64 percent of the total shale oil resources” in the US. The Intek Inc study for the EIA had relied largely on oil industry claims, rather than proper data. Hitesh Mohan, who authored the Intek study for the EIA, reportedly conceded that “his figures were derived from technical reports and presentations from oil companies, including Occidental Petroleum, which owns the lion’s share of oil leases in the Monterey Shale, at 1.6 million acres.” Mohan had even lifted his original estimate for the EIA to 17 billion barrels. As I’d reported earlier in June last year, a wider PCI study by Hughes had come to similar conclusions about bullish estimates of US shale oil and gas potential, concluding that “light tight oil production in the USA will peak between 2015 and 2017, followed by a steep decline”, while shale gas production would likely peak next year. In that post, I’d pointed out previous well-documented, and alarmingly common, cases of industry over-estimates of reserve sizes which later had been questioned. The latest revelations follow a spate of bad news for industry reassurances about the fracking boom. New research published this month has found that measured methane leaks from fracking operations were three times larger than forecasted. The US Environment Protection Agency therefore “significantly underestimates” methane emissions from fracking, by as much as a 100 to a 1,000 times according to a new Proceedings of the National Academy of Sciences study published in April. 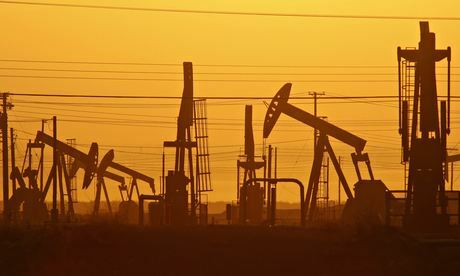 The Associated Press also reported, citing a Government Accountability Office investigation, that the US Interior Department’s Bureau of Land Management had failed to adequately inspect thousands of oil and gas wells that are potentially high risk for water and environmental damage. According to a secret trade memo obtained by the Huffington Post, the Obama administration and the European Union are pushing ahead with efforts to “expand US fracking, offshore oil drilling and natural gas exploration”, as well as exports to the EU, under the prospective Transatlantic Trade and Investment Partnership (TTIP) agreement. The film FrackNation flighted to sparsely populated cinemas in Cape Town and Johannesburg by Ivo Vegter was co-directed by Phelim McAleer. The film, unsurprisingly hailed by the oil and gas industry as a factual and honest representation of fracking, may lose some of its support in the light of this literary comedy posted by McAleer in August 2013. My response addresses McAleer’s text – point by point. The director of FrackNation explodes the myths put about by fracktivists. Phelim McAleer, an Irish filmmaker based in America whose pro-fracking movieFrackNation is described by the New York Times as ‘meticulously researched and provocative’, has had his fair share of run-ins with ‘fracktivists’. Here, he picks apart the 10 biggest lies told by the anti-fracking lobby. Actually, far from being liberal, open-minded souls bringing truth to power in a kinder, gentler way, anti-fracking activists have chosen a new disposition: angry! I guess no one told the fracktivists that just because we don’t agree doesn’t mean we can’t get along. Watch Vera Scroggins, for example. @phelimmcaleer Come debate me, Phelim, you lumpy old gas whore. Who’s paying you? @phelimmcaleer Phelim, you are a dreadful filmmaker. But come debate me, you tired old bullshitter. Sean Lennon – son of peace activists John Lennon and Yoko Ono – thought that someone who disagreed with him on fracking was a good ‘argument for abortion’. Or, if you’re still not convinced, just peruse the comments on my movie’sFacebook page left by anti-fracking activists. Such pleasant people! From news coverage, you would think that everyone in America hates fracking. Even the name sounds awful. Who could support such a terrible practice? Well, it turns out that just about everyone who lives with it loves it. Dimock, Pennsylvania is one place where all journalists reported that everyone hates fracking. Yes, there were 11 families in the village involved in a very lucrative lawsuit with an oil-and-gas company, and the journalists always interviewed them. But they completely ignored a petition signed by 1,500 people in the community who said their water was fine and had not been affected by fracking. What is 11 out of 1,500? Less than 1%. It’s the 99% who support fracking. There is one other group that is opposed to fracking in Pennsylvania – the New York elite. This coalition of grumpy hipsters and celebrities have holiday homes in Pennsylvania, or they’re concerned that if a new industry brings wealth and progress to PA then the ‘traditional’ (read poor) way of life there will be destroyed. So once or twice a year, the likes of Mark Ruffalo, Susan Sarandon and Yoko Ono get bussed in from the city to meet disgruntled locals, and then are chauffeured back to their gas-heated homes after another day of successfully blocking natural-gas development. At least 20 anti-fracking candidates were rejected by New York voters (New York is supposed to be the heartland of anti-fracking sentiment). But hey, keep protesting, fracktivists – after all, democracy is for the little people, and you can walk all over them on your way to your next starry TV interview about the ‘evils’ of fracking. Sorry, you’re wrong. Trick question. The first fracked well was in 1947! And more than one million wells have been fracked in the US since then (2.5million worldwide). In terms of industrial processes, it doesn’t get much older or more thoroughly tested than fracking. No lie about fracking is more widely believed than this old canard. It was popularised by Josh Fox in his HBO-funded documentary, Gasland. In it he shows a man who can light his tap water on fire, supposedly because of fracking. I asked Josh about reports that some people could light their water before fracking occurred. He didn’t like this question. He eventually admitted that he knew people could light their tap water on fire decades before fracking ever started but chose not to include this fact in his documentary because ‘it wasn’t relevant’. There are three places in the US called Burning Springs, and there are historical records of people lighting their water since the 1600s. If fracking doesn’t make your water flammable, it must at least contaminate it with dangerous chemicals, right? Not according to Lisa Jackson, the former head of the US Environmental Protection Agency (EPA) and no friend to big business. She testified before Congress that there have been zero proven cases of water contamination due to fracking. That’s right – one million fracked wells later, there are no examples of contaminated water anywhere. Zero. This is the anti-fracking playbook. Scare people, get media attention. And when the science comes in debunking the scare story, move on to the next scare story. Fracking fluid is 98.5% water, 1% sand, and 0.5% chemical additives. Some of these additives are also used in making ice cream! Colorado’s Democratic governor, John Hickenlooper, drank fracking fluid to prove its safety to his local residents. But these are still chemicals and we should be scared of them – that is the cry of the fracktivists. But water is a chemical. Coffee has a whole bunch of chemicals in it. Everything is a chemical. Don’t be duped by bad science (like the people these American comedians convinced to ban the scary sounding ‘dihydrogen monoxide’). The Associated Press interviewed leading cancer researchers who all concluded: there was no spike. Did Fox apologise for scaring women and families? No. He’s an environmental activist. The media don’t ask him difficult questions or demand that he clears the record. Less than a year later, HBO released Gasland Part 2, Fox’s sequel about the dangers of fracking. There was no mention of breast cancer in it, and he has never withdrawn his original claim. This is the anti-fracking playbook. Scare people, get media attention. And when the science comes in debunking the scare story, move on to the next scare story. One of the scarier arguments against fracking is that it causes earthquakes, especially if you live in a tectonically charged US state, like I do. Yet all activity under the ground affects the earth, and if you don’t like this fact then you should also campaign to ban supposedly eco-friendly hydro-power, which actually hascaused earthquakes (but they only affected Indians, so environmentalists don’t care – just so long as the energy created was ‘sustainable’). But the biggest cause of man-made earthquakes is the environmentalists’ favourite power source: geo-thermal. It seems that some earthquakes are more equal than others. The process of fracking (which is separate from drilling) is noisy and looks messy – for a few days. Then the land is reclaimed and the industry moves on to the next area. All the scary photos of huge machinery and big trucks are taken during this initial process. Which is a bit like photographing the building site of a half-built house and saying all house-building should be banned. As a filmmaker, my biggest problem was trying to film working gas wells in a way that would look interesting. They are tiny and often hidden behind hills or behind bushes and trees. Oh, and fracking does create traffic. That claim is true. Locals call this ‘jobs’. They generally like it. They may complain sometimes but they know that the only thing worse than traffic in rural America is no traffic. Phelim McAleer is co-director of FrackNation. Coming out clearly and unsurprisingly, on the side of the pro-fracking lobby, McAleer, proclaims ten ‘big fat lies’ that in his view are propagated by anti-fracking activists. This critical review of his claims is intended as a factual evaluation. I’m not sure that the adjective ‘nice’ is relevant to a debate on any subject, nor whether it is incumbent on debaters to ‘love’ debating. Having led an anti-fracking campaign in South Africa for three years, it is not my experience that any serious environmentalist, or debater for that matter, relies on being ‘nice’ to score rhetorical or actual victories. Nevertheless, accepting, for the time being, McAleer’s application of ‘nice and ‘love’’ and the supposed claim thereof by the anti-fracking camp, prompts me to share just one of my own experiences with you. Grealy, at the time of these tweets proclaimed on his Twitter profile that ‘Shale gas is far too important to be politicised’. It is relevant that Grealy had never met or spoken to me personally and so had no personal knowledge of me, or of my political persuasion. I quote the Tweet and then explain what material (if any accompanied it). Tweet 1: “Saw this and thought of @timelesskaroo pic.twitter.com/k4CqvO1hWs” (The published picture was a signboard from decades ago in South Africa, posted at public facilities, and saying (reserved for white people). Tweet 2: “Bury gas and bury black people, the @timelesskaroo way”. http://www.bbc.co.uk/news/world-afr (the link is to a video in which I was interviewed by BBC London). Tweet 8:“Thanks to Street View we can [sic] what @goldmanprize is preserving in Graaf-Reinet via a $150K prize to @TimelessKaroo pic.twitter.com/4yynZuZ24k” (Another view of a street in a poor area). The point here is to reveal that in every individual or collective ego, one may identify and expose aspects that are not ‘nice’, and of course to dispense with McAleer’s absurd statement by saying that – for every Baldwin he can find, I can find a Grealy. And that’s no lie. McAleer doesn’t offer a source for this statement. But let’s accept that he heard it or read it (and can provide the source). I have never, and would never rely on such an obscure statement to support my view on fracking. What does interestingly emerge from McAleer’s views on ‘lie No 2’ is that he may unwittingly or knowingly have propagated a lie of his own. I quote: “Well, it turns out that just about everyone who lives with it loves it,” claims McAleer. Using the town of Dimmock, PA, some NYS election results and a sweeping statement of his own about grumpy hipsters and celebrities against fracking, McAleer conveniently ignores the more than 210 current (and growing) bans, restrictions or moratoria in various countries around the world, on fracking or parts of the shale gas mining process. McAleer, would do well to substantiate his allegation in defense of ‘lie No2’ by telling readers within the context of his statement what he means by “just about everyone.” Is that 99 out of 100, 500 out of a 1000, 3 out of ten, all the people in one street? No Mr. McAleer, I don’t believe your claim, or the claim that everyone hates fracking. I wonder if this factual void is a benchmark for the truthfulness of your film? Once again, we’ve never used that line in the way that you present it, and although I have heard it used, it certainly does not represent the mainstream and informed anti-fracking view. Your ‘quiz’ just went ‘pop.’ Why? Simply because you disingenuously seek to do exactly what the real liars (the oil and gas industry do), when referring to fracking. Simply put, a ‘good ole boy’ wildcatter in Texas in 1947, using dynamite to frack a well is a long stretch from high-volume, horizontal, slickwater fracking that has been commercially practiced for less than 15 years. McAleer also claims 2.5 million fracks (1.5 million outside of the US) – proof please? McAleer’s lie No. 3 about lie No. 3 dispensed with. McAleer rightfully points out this highly contested issue. There is no doubt that methane has and does occur naturally in water aquifers in many countries around the world. Shrewdly, McAleer focuses on instances relating to Josh Fox’s controversial film, but chooses to ignore evidence from independent tests that show increased methane levels in areas where natural gas drilling has taken place. I don’t forward this observation as defense of the statement that ‘Fracking makes your water flammable’ as there are most certainly places where drilling has taken place where people are not lighting their water on fire. However, the opposite (as McAleer seems to suggest by labeling this statement a lie) i.e. Fracking does not make your water flammable is similarly untrue. McAleer’s lie No 4. About methane in water up in hot air. Assuming that he has banked the last point, (on flammable water) McAleer, points those opposed to fracking as desperately seeking proof of some other nefarious side effect of fracking. “If fracking doesn’t make your water flammable, it must at least contaminate it with dangerous chemicals, right?” McAleer quotes Lisa Jackson from the EPA, but conveniently fails to place in context for the reader, the many non-disclosure agreements signed between gas drillers and people who have left the homes that they used to live in. Some of the homes within 30 minutes drive from the where the star of Fracknation lives. But the self-administered coup de grace in connection with this ‘Lie number 5’ is this statement from McAleer’s own pen: ‘That’s right – one million fracked wells later, there are no examples of contaminated water anywhere. Zero.’ Rewind. Did you write one million fracked wells? What happened to 2.5 million? McAleer sets the scene for his next exposē by suggesting that science has debunked the ‘scare story’ and so anti-frackers, ‘move on to the next scare story’. McAleer faithfully repeats the proportions of water, proppants and chemicals quoted by the gas drillers. Linking the word ‘chemical’ with such acceptable substances as coffee, toothpaste and ice-cream, McAleer quotes Governor Hickenlooper (whose state is currently facing a plethora of fracking bans – from all those people ‘who live with fracking and love it’) as having consumed fracking water on TV. Now, sure as God made little apples, McAleer, Hickenlooper and anyone possessed of basic skills of deduction and reasoning know full well that if three samples of fracking flowback water are selected from three different states in an independent, random and scientifically-monitored selection process, neither Hickenlooper, nor McAleer, or even Arnold Schwarzenegger would chug it down. And that’s the truth! McAleer neglects to point out that .5% by volume in a 5 million gallon (20 million liter frack job) will be around 25 to 30 tons of liquid and solid chemicals. That’s an awful lot of toothpaste, coffee and ice cream Phelim. Dr. Theo Colborn, (who surely must be known to one able to write so authoritatively on fracking as McAleer does) has written and lectured widely on the human health and environmental threat posed by endocrine disruptors and other industrially produced chemicals at low concentrations in the environment. Dr. Colborn serves as the President of TEDX and holds the academic rank of Professor Emeritus, University of Florida, Gainesville, Florida. TEDX’s programs and finances are overseen by a Board of Directors, whose specialties include public health service, environmental policy development and analysis, environmental advocacy, medical ethics, philosophy and children’s environmental health. In the experience of Treasure Karoo Action Group, TEDX reports are peer-reviewed. Perhaps the so-called lie should be turned around – seeing as it is framed as a lie: ‘fracking doesn’t cause breast cancer’? Who would be lying then? Oh, my word! Is McAleer writing for primary school children? Even people that live in other countries can do the math on that one. The documented issues surrounding water and fracking, wherever the technology is taking place, are well known, and by attempting to sweep them under the carpet with such a meaningless comparison, McAleer exposes himself as an inexpert liar. No lie. But that’s not the only reason that fracking should be banned. Ohio, Oklahoma and Texas have their own case studies by scientists from both sides of the debate. The link between fracking and earthquakes under certain circumstances and parameters is conclusive. It does not automatically follow that seismic activity is a reason for a blanket global ban on fracking. In areas where additional man-induced seismic activity could result in earthquakes that may damage property, aquifers or endanger human life, there is a good reason to ban it in that location. Not clever to hang the whole point on an extreme, Phelim. Lie No. 10 Fracking destroys the landscape and disturbs bucolic rural [sic] America. One statement (excluding the tautology) that I am prepared to support, with a proviso. Fracking destroys the landscape where it takes place and disturbs ‘bucolic’ rural America. McAleer endeavours to skillfully dismember fracking from shale gas mining by writing: ‘the process of fracking (which is separate from drilling) is noisy and looks messy – for a few days…’ He goes so far as to write that ‘working gas wells’ are ‘tiny and often hidden behind hills or behind bushes and trees’. Enough already. If any serious pro-gas adult is prepared to align themselves with the TEN BIG FAT LIES of McAleer, they deserve to be treated with the same derision and amusement afforded the stars of Dumb and Dumber and Beavis and Butthead. It is remarkable that the director of a film so enthusiastically endorsed by oil & gas and Opportunista’s would place his supporters in the position of defending his (may I use the word again) tripe. Anyone with experience in the issues of the global shale gas debate that is prepared to endorse and propagate what McAleer has written here is either stupid or a big fat liar. Shell South Africa Country Chairman, Bonang Mohale, on behalf of Royal Dutch Shell in SA 2011. Claim repeated frequently by Shell executives in South Africa. Andrew Nikiforuk, “Shale Gas: Myth and Realities,” The Tyee, Jan 7, 2013. In an unsurprising role reversal, a pro-fracker has weighed in to my review of Phelim McAleer’s article. It appears that it’s not only anti-frackers who are angry. In one fell swoop @informedblackmn has demonstrated that McAleer’s first point (Lie No. 1) is as believable as his claim that he is ‘an independent voice, a journalist with an international perspective who has researched fracking for over two years in two continents’. Read on to follow the whole story. November 8, Howick, Kwa-Zulu-Natal. 2013 Symposium of Contemporary Conservation Practice. Nigel Rossouw, Shell, SA, Upstream talking on Shell’s water requirements for fracking exploration and later, production. Shell SA is able to draw water once off, use, it, recycle it and use it for the next gas well. This according to Shell SA Upstream Project Manager, Nigel Rossouw. Rossouw was representing the oil and gas giant and claimed that the company could draw water once and use that same water for following wells. Now, let’s consider what was stated. For this to be true, Shell would recover all of the injected water, treat all of it and start the next well with the same water, and again, and again. Clearly, this is impossible. It calls to mind the deliberate untruths told by Shell SA Chairman to the public that Shell is so good at recycling fracking fluid that they can recycle 95% of the water and that when they are finished it is so clean that communities can use it to wash streets and water golf courses. In conclusion: What are we dealing with? (a) A senior Shell manager who is briefed to address a critically important group of people and who simply doesn’t know what he’s talking about? (b) A deliberate untruth to make the water issue appear as a non-issue? It is exactly this type of untruthful statement*, in public, to the public addressing a very serious issue about I which have complained numerous times. TKAG regards Shell, and Shell’s misinformation to South Africans*, including the leaders of this country, as being responsible for the euphoria about the ‘game-changing’ shale gas. This while international bans in significant jurisdictions mount on a daily basis. The industry too, has developed a new habit of referring to water in 1000’s of cubic metres. So of course 1 or 2 thousand cubic metres sounds much less than 1 or 2 million. Cubic metres mean very little to the man in the street – imagine going into the grocery store and asking for one 1 thousandth of a cubic metre of milk. Or pulling into any filling station and asking the pump attendant for 90 thousandths of a cubic metre of diesel? Apart from this, the figure of ten thousand cubic metres of water in a production well is well on the side of optimistic. Wells in Marcellus, which are shallower than those expected in the Karoo routinely use between 5 and 7 million GALLONS of water or about 20 to 24 MILLION litres. *TKAG requested a national debate with Shell in any public forum, at Shell’s convenience.